Over the next month, we will be previewing every team in the NBA. Here is the next installment of our series on the Portland Trail Blazers. After injuries contributed to a disappointing finish last season, a mass exodus of key contributors have left Portland a shell of the 51-win team last season. The front office has assembled an intriguing collection of youth in their place to grow along star point guard Damian Lillard as the Blazers rebuild on the fly in a loaded Western Conference. Throughout the Sports Center highlight era of basketball, it seems that the minor tasks players excel at in order to help their team win never get noticed. But as Lillard attempts to shoulder the sole weight of this Portland franchise, a young, unproven supporting cast will need to master an unheralded art: setting screens. Since Terry Stotts came to town, the Blazers' big men have become one of the best teams in the NBA at “flipping” screens (also referred to as “changing the angle”) during pick-and-rolls. It’s an often unnoticed act that has played a part in Lillard becoming the scoring machine he is today. Changing the angle of a screen puts a tremendous amount of pressure on defenses that rely on quick and clear communication during pick-and-rolls. In the blink of an eye, an opposing big man must call out a coverage to the on-ball defender, something that is usually a pre-planned tactic based on a combination of the personnel involved (think strengths/weakness of the screener and ballhandler) and the spot on the floor the action is taking place. The player guarding the ball then must adjust his positioning in order to make sure the opposing ballhandler is funnelled to where his teammate is waiting to help corral him. Flipping a screen, especially at the last second before defense can react, typically adds a new set of challenges for defenders to overcome on the fly. This is what a typically “Blue” or “Down” coverage looks like. Utah’s Dante Exum, the player guarding Lillard, is positioning himself between Lillard and the screener, Robin Lopez, in an attempt to force Portland’s playmaking point guard away from the middle of the floor. Rudy Gobert, the Jazz’s shot-blocking savant, awaits Lillard on that side of the floor. If Lopez doesn’t move, Exum can stay attached to Lillard’s hip as he drives low, channelling him directly to Gobert and forcing Lillard to play solely “in the pocket”, or basically 1-on-2 against the big and on-ball defender. But what the Blazers do really well in situations like this, as you saw in the previous clips, is have their bigs position themselves while screening in a way that gives Lillard a new set of options to exploit the defense. In this screenshot from the thunderous Lillard dunk in the video above, you can see how Portland’s Joel Freeland wraps around underneath to impede Exum from getting into Lillard as he begins to attack the big. 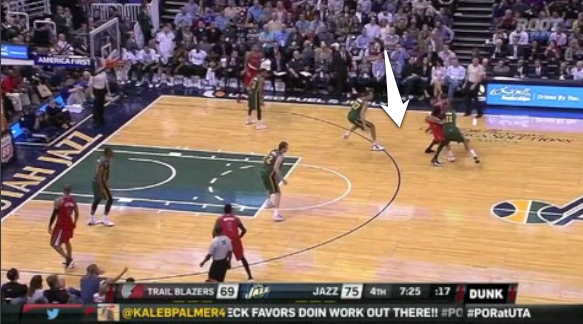 Exum is essentially faced with a new, not very fun, choice; work “over” the screen, trailing behind Lillard and turning a 1-on-2 “in the pocket” scenario (like shown above) into a 1-on-1 between Lillard and backpedaling big or go “under” the Freeland screen, potentially opening up the option for Portland’s star guard to dribble into an uncontested 3. More choices for an offensive player, especially when they come before opponents can communicate the change, is bad news for any defense and a big reason why Lillard and the Blazers were so feared in pick-and-roll situations last year. The problem for Portland is that all these defections mean nearly every big that paired Lillard last season is wearing the uniform of another NBA club. As you can imagine, this clever dance needs chemistry and cohesion on the offensive side as well. That means Lillard’s new group of screen-setters learn this subtle artform quickly if they want to help their All-Star point guard find open space in defenses that will now be keying solely on him every game. With a revamped backcourt and wing rotation, the Blazers will be relying on heavily on these two holdovers duo to provide major production during their time on the floor together. Last season, McCollum and Lillard combined to go +7.6 per 48 minutes with an offensive rating of 107.3 in their 421 minutes together, per NBA.com data. Both are solid marks that should provide hope for Blazers fans that these two can form a potent duo next season despite all the departures, especially as the team tries to find a go-to crunch time lineup. But before thinking that a heavy dose of Lillard and McCollum could make Portland surprisingly competitive, even 421-minute sample sizes is small enough it can’t be taken as a precursor for success. These two players will certainly have their problems on that end of the floor against some of the league’s better pairings, especially given Lillard’s indifference to defense. In general, Stotts won’t be able to play the matchup game as much this season, because a summer full of defections has left his wing rotation stripped bare (and one of those new additions, Gerald Henderson, may not be ready to start the season). And given Blazers lack of shooting on the wings (which we’ll get into more in a second) along with the need for another creator alongside Lillard, Stotts will likely need to play McCollum -- a 39.6 percent 3-point shooter and emerging pick-and-roll scorer -- alongside Lillard for extended minutes simply to keep his offense afloat. How these two fair during that time will likely determine not just how competitive Portland will be this season, but also whether McCollum and Lillard can be considered long-term fits as the franchise heads in a new direction. Though Portland did a solid job of restocking the cupboards with young, talented players in the wake of so many free agent departures, they are left with very few playmakers. While players like Matthews and Batum weren’t go-to guys, they could operate as secondary ballhandlers in pick-and-rolls. Aldridge was obviously able to attack or shift defenses with his work in post ups and isolations while even Robin Lopez was given some opportunities to create offense as a passer in Portland’s “Corner” action. What’s left on this roster are a number of players that typically rely heavily on others to create openings in the defense for them. 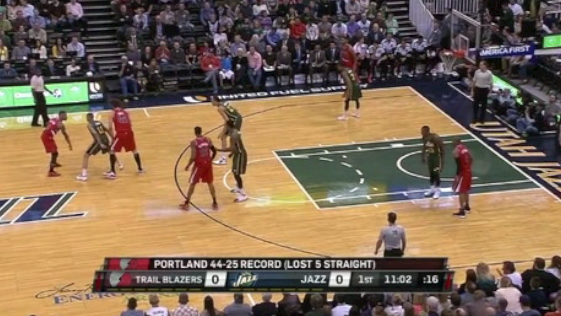 Which is where Lillard comes in. Over the past few seasons, we’ve all seen how effective he is as a scorer, as Lillard’s two straight seasons of averaging over 20 points per game attest to. But without Aldridge, or ever Batum and Matthews to share the burden of creating good offense, it will fall solely on Lillard to not just create shots for himself, but the rest of the team as well. This is where Lillard’s game needs to reach a new level, as last year he finished just 20th in Assist Opportunities (passes to a teammate that lead to a shot attempt, made or not), per NBA.com’s player tracking data. For someone who played with as many weapons as he did last season and has the ability to make a wide variety of passes, that rank is shockingly low. It will be interesting to watch how Lillard responds to his increased burden with the franchise. If he keeps up his gunning ways, we will likely see his scoring numbers go way up while his efficiency takes a major hit. But if Lillard learns the art of controlling games without taking oodles of shots to do it, you will see an All-Star-level talent evolve into an even more complete player. How will Terry Stotts overcome a lack of shooting on the wing? For a team that finished third in the NBA in 3-point attempts last year, it was curious to see Portland choose restock their wing cupboard with so many subpar long-distance shooters. Nic Batum, Wes Matthews and Arron Afflalo’s gravity as 3-point snipers helped create valuable space for players like Aldridge and Lillard to operate. Not a single one of the three players signed or traded for this offseason -- Al Farouq Aminu, Gerald Henderson and Mo Harkless -- to fill out Portland’s wing rotation can remotely come close to matching their production from beyond the arc. In fact, Batum’s career 3-point percentage of 36.3 percent is over six percentage points better than highest of the incoming trio’s, and Batum (who shot poorly from 3 last season) holds the lowest career mark of the three departing Blazers. With his best remaining player, Lillard, being a pick-and-roll point guard Stotts will have his hands full trying to create space around him with this new wings. If defenders can freely sag off Portland’s perimeter players, it will make Lillard’s already difficult task of propping up the team’s offense borderline impossible. Stotts will need to either juggle his rotation to make sure two of his holdovers that held their own from 3-point territory last year -- McCollum and third-year man Allen Crabbe (35.3 percent from deep this past season) -- are always paired with one of his limited newcomers or get very creative with his offensive sets to hide the shooting deficiencies of Aminu, Henderson and/or Harkless. Lillard embraces his inner playmaker. Meyers Leonard and Noah Vonleh prove to be a productive pair of stretch 4’s around a revitalized Mason Plumlee. Aminu and Henderson help Stotts keep the team competitive defensively. Lillard turns into a volume scorer. Stotts struggles to keep a group of young bigs (and Lillard) playing passable defense. Aminu and Henderson’s presence on the wings torpedoes the team’s spacing on offense while the McCollum-Lillard pairing gets torched defensively, meaning Stotts is always giving up something no matter who plays on the wing next to Lillard. Click here for a full list of NBA Season Previews from Brett Koremenos.